The placenta may be usefully understood as a "parasite" feeding on blood from the endometrium. Imagine scooping out a portion of the endometrium. The resulting bowl will fill with blood from broken vessels in the endometrial stroma. Now lay a cover over the bowl, and imagine many "roots" extending down from the cover into the blood-filled hollow. The roots can can absorb oxygen and nutrients from the blood in which they are bathed. The cover is the chorionic plate of the placenta. The "roots" are the chorionic villi. Both the placenta and the chorionic villi are entirely fetal tissue (orange in the diagram above). "Anchoring villi" attach the placenta to the endometrium. Smaller branching villi extend out into the intervillous space. 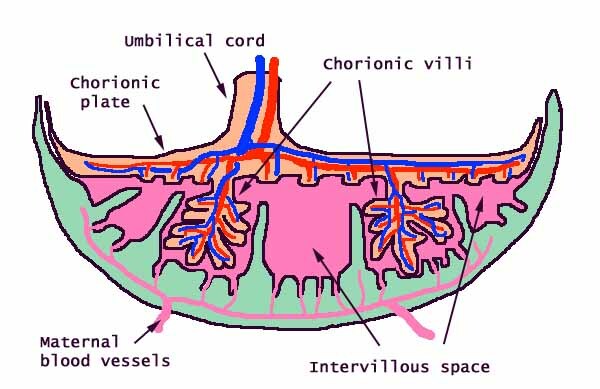 Fetal circulation passes down the umbilical cord, though vessels in the villi, and back up the umbilical cord. Maternal blood "spills" from open endometrial arteries (the spiral arteries) into the intervillous space (pink in the diagram above), and returns into endometrial veins. Thus the chorionic villi are surrounded and bathed by "lakes" of maternal blood. Within the intervillous space, maternal blood is not contained by blood vessels. The surface of the chorionic villi is an epithelial layer, the fetal syncytiotrophoblast, which has the ability to grow invasively into the maternal endometrium. The syncytiotrophoblast also has microvilli on the surface for absorbing nutrients from maternal blood. In the extravagant name "syncytiotrophoblast", syncytio- tells us that this is a syncytium, a tissue in which many nuclei occupy a large cytoplasmic volume without separation into individual cells (skeletal muscle fibers are a more familar example of syncytial tissue); tropho- tells us that this tissue provides nutrition; and -blast tells us that it is growing. Beneath the syncytiotrophoblast (i.e., toward the core of the villus), is the cytotrophoblast, a layer of cuboidal cells which eventually disappear. (The cytotrophoblast also forms trophoblast columns, masses of cells filling the ends of anchoring villi.) Maternal endometrial stromal tissue adjacent to the placenta differentiates into large decidual cells (so named because the outer layer of the endometrium is shed at birth along with the placenta). Decidual cells may intermix with fetal cells in the cytotrophoblast. The boundary between maternal and fetal tissue is immunologically interesting. For micrographs of placenta, see WebPath (decidual cells), WebPath (first trimester chorionic villi), WebPath (second trimester chorionic villi), and WebPath (third trimester chorionic villi). Forming the core of each chorionic villus is mesenchymal stroma containing fetal blood vessels. Fetal circulation is entirely closed, confined to vessels within the chorionic villi. Maternal blood flow though the placenta is open. "Lakes" of maternal blood fill the intervillous space, uncontained by any endothelial lining. Between maternal blood and fetal blood lies the thin syncytiotrophoblast and the fetal capillary endothelium, across which all exchange of gases, nutrients, hormones, and wastes occurs. The umbilical cord is simply a conduit carrying fetal blood between the fetus and the placenta. It normally contains two arteries and one vein, surrounded by extensive mesenchymal tissue ("Wharton's jelly").